Lightning's Girl: A Mailing Envelope that Folds Into a Record Player. No Really ! 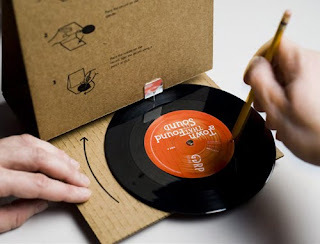 A Mailing Envelope that Folds Into a Record Player. No Really ! Griffiths, Gibson and Ramsay Productions seems to have a hit on its hands with a direct mail promotional piece that it started mailing out to ad agencies across Canada and the United States in April. Rather than throwing them in the bin, creative directors are calling the Vancouver-based sound design studio to get extra copies to take home to their kids. “It’s actually shocking how good the sound quality is,” said Geoff Dawson, associate director at Grey, adding that it took a long time to play with different materials and designs to get the audio just right. Dawson says he hit on the idea while creating a website and new brand identity for GGRP earlier this year. “As soon as we saw and heard the record promo piece, we knew it was perfect for GGRP,” said GGRP partner Gord Lord, in a release. Dawson said the agency’s brief was to showcase GGRP’s creativity and love for sound.